There are a few free newspaper archives available online that focus on the African American community, or on anti-slavery, or both. These are valuable resources for black history in general, and for black family history in particular. I hope to one day see more materials like this available online (Google News Archives, are you listening?). Freedom's Journal (1827-1829), a weekly publication from New York City, and widely regarded as the first major African-American newspaper in the country. The Friend of Man (1836-1842), an anti-slavery publication from upstate New York. 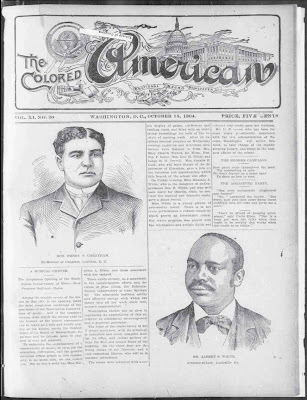 The Colored American (1893-early 1900s), a Washington DC newspaper with a national focus, made available through the Library of Congress. Muncie Times Newspaper (1991-current). A contemporary African American newspaper serving communities in Indiana, and one of the few I've found with an appreciable archive. Google News Archives includes several black newspapers, including the Washington Afro-American, and similar publications from Baltimore and Richmond. To search include source:afro along with your search terms. NewspaperArchive.com, is the world's largest online newspaper archive. They haven't yet made clear which of their publications are African American, but with billions of articles to search, they are certainly worth a visit for any serious genealogy researcher. And lest we forget, a few earlier posts on black family history resources: African American Genealogy, Michelle Obama's Family Tree, and Slaves and Slavery. African American Newspapers accessible online as a component of digitization activities at libraries and authentic social orders and also digitization ventures done by Google. The substance is accessible for nothing, however it is at the attentiveness of the organization giving the substance.